There are plenty of ways to manage your SMS messages on Android, from independent apps like Chomp SMS to Google's own Hangouts. Fresh in the Play Store this week is a new Messenger app, an upgrade on Google's native SMS tool that was the default option before Hangouts got SMS capabilities. Here's how to set it up as your new texting app of choice. When you launch the app for the first time it will automatically funnel in your SMS database (if you're using Hangouts at least) but it won't make itself the default app straight away. To do this, tap on the menu button (three vertical dots), choose Settings and then Set as your default SMS app. Tap through the confirmation dialog and you're good to go. If Messenger is the current default, the option reads Change your default SMS app instead—tap on it to access the selection screen in Android's settings. From here you can choose between all of the SMS apps currently installed on your phone (it's behind the More... link under the Wireless & Networks heading if you want to find it later). All the usual SMS options are available on the Messenger settings page, including notifications, read receipts and MMS handling. 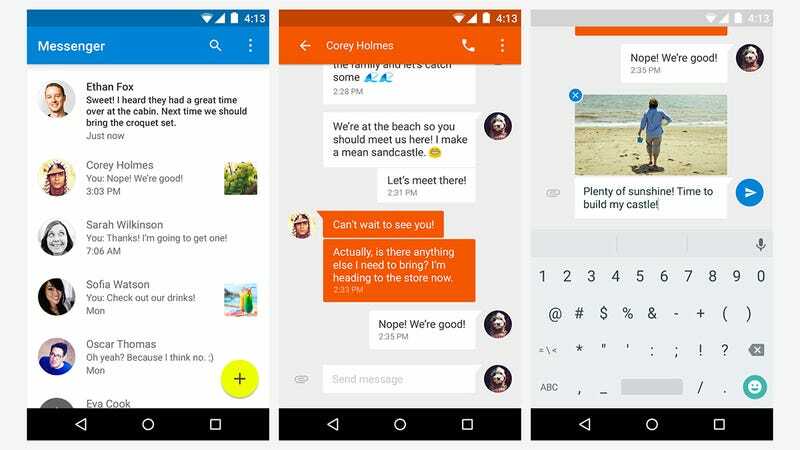 The app itself is fully fitted out with Google's new Material Design look and the colors of your conversations are based on the contact image associated with it. Swipe left or right to archive a conversation (archived threads can be found via the Archived option on the app menu or through the search function); tap and hold to archive, mute or delete a conversation. When you're viewing an SMS thread you can tap on a contact picture to bring up more details about the individual. Tap and hold on a single message to copy, delete or forward it, or to see the details of the message. When you're composing an SMS you can tap on the paperclip icon to add an image, video clip or voice recording to your message.